Jamess Parlour at Alkington Grange Barns in Alkington, near Whitchurch sleeps 12 people. Dating back to the 17th century, Alkington Grange Barns are barn conversions (refs 30917, 30918 [Emmas Dairy], 30919 [Olivers Mill] and 30920 [Williams Hayloft]) which are set around a courtyard on a 100-acre, family-run working arable and livestock farm, just a few miles from Whitchurch. They have been lovingly and thoughtfully converted to offer very welcoming holiday accommodation, retaining many original features including exposed oak beams and trusses, whilst at the same time offering all the comforts needed to create a charming homely atmosphere. The front courtyard outside these Shropshire cottages boasts an impressive Georgian hay barn, now a shared undercover area for relaxing or enjoying a barbecue, while the children can play in the adjoining children’s play area. The barns also share a multi-sports court for tennis, badminton and football, as well as a fantastic indoor heated swimming pool. The shared swimming pool at Alkington Grange Barns is available for exclusive use for each barn and booking slots are available throughout the day, booked on your arrival. The swimming pool is open all year round but opening times may vary. A woodland picnic area lies a short walk away from your barn. Walkers can explore the Shropshire Union Canal, just 5 minutes away, and the Shropshire Way footpath runs through the farm. For cyclists, the Mercian Cycle Path runs past the farm. Whilst the barns enjoy a peaceful rural setting, they are still very close to amenities. Whitchurch is approximately 2½ miles away, the delightful market town has many splendid buildings from medieval, Tudor and Georgian times, all dominated by St. Alkmund’s Church. Internationally renowned for its clock production dating back to the 1650s, Whitchurch is known as ’the Home of Tower Clocks’, and a fine example can be seen on one of the barns. There are many excellent shops, pubs and restaurants in the town which is perfectly placed for touring all of Shropshire, North Wales and Cheshire. Attractions close by include Ellesmere with its beautiful lakes, 11 miles, a variety of National Trust mansions and gardens, and the historical city of Chester with its excellent shopping and famous races, and the well-renowned Chester Zoo, 26 miles, with the Blue Planet Aquarium nearby. Other places of interest include Hawkstone Follies, Cheshire Ice Cream Farm, RAF Cosford, Fenn’s and Whixall Mosses, and the incredible Ironbridge Gorge. For great shopping, there is Shrewsbury with its medieval architecture and riverside walks, and Telford with its indoor shopping centre. Delamere Forest with its Go Ape Treetop Adventure makes a fantastic family day out. With so much to see and do, Alkington Grange Barns makes a wonderful location for an enjoyable year-round holiday. James’s Parlour (30917) is the largest of the four barns, with five bedrooms and a sociable open plan living area, making it ideal for a large family or group of friends. 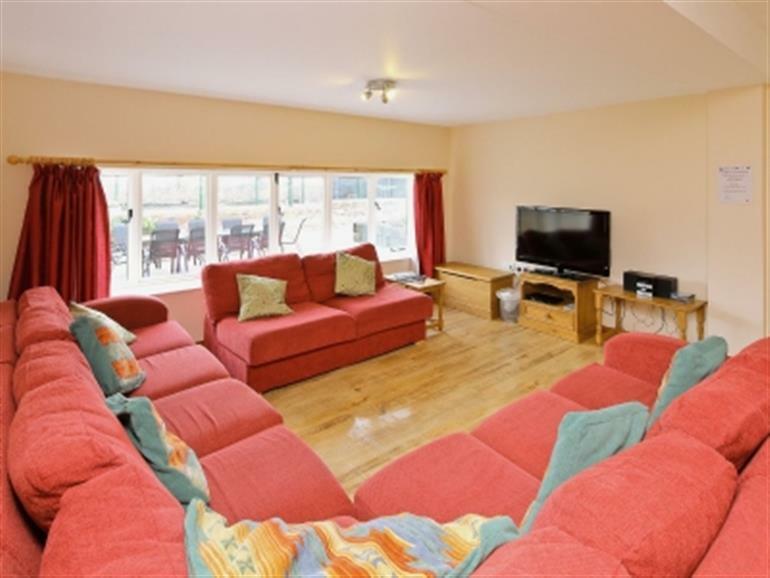 Emma’s Dairy (30918) offers an open-plan living room and a well equipped kitchen with breakfast bar, as well as three cosy bedrooms enabling five to share this lovely holiday home. William’s Hayloft (30920) offers cosy, characterful bedrooms, one with an en suite, and a spacious sitting room with a woodburning stove. The enclosed front garden is perfect for dining alfresco, and relaxing after an enjoyable swim. Oliver’s Mill (30919) is a spacious terraced barn providing five bedrooms, one with an en suite, and a spacious living area with a cosy wood burner. The shop and restaurant are 2 miles, with the pub 1 mile from Jamess Parlour at Alkington Grange Barns. 2 steps to entrance. Ground floor: Living/dining room/kitchen with wooden floor. 1 twin bedroom with en suite bathroom with shower over bath and toilet (also accessed via hallway). First floor: 4 bedrooms: 3 double, one with en suite shower room and toilet, one with additional double, 1 twin. Bathroom with corner bath, shower attachment and toilet. Most rooms with beams. 42 Freeview TV. Blu-ray. Ample parking. All properties: Oil central heating, electricity, bed linen and towels included. Travel cot. High chair. Stereo/CD. Electric cooker. Microwave. Washing machine. Shared coin-operated tumble dryer in utility room. Dishwasher. Fridge/freezer. Wi-Fi. Enclosed garden with patio, sitting-out area and furniture. Shared barbecue. Shared 100-acre natural grounds. Cycle store. Shared indoor heated swimming pool (7.5m x 3.5m, depth 1.2m), open 10am to 5pm all year, times vary (exclusive use by booking slots). Shared tennis court. Covered children’s play area. No smoking. Holidays at Jamess Parlour at Alkington Grange Barns run from Friday to Friday. NB: Fenced pond in grounds, 50 yards. For a better idea of where Alkington Grange Barns - Jamess Parlour is, you can see Alkington Grange Barns - Jamess Parlour on the map below. You can find more large holiday cottages (that's cottages which sleep 8 or more people) in Shropshire. If you want to see more large cottages, have a look at large cottages in Shropshire. 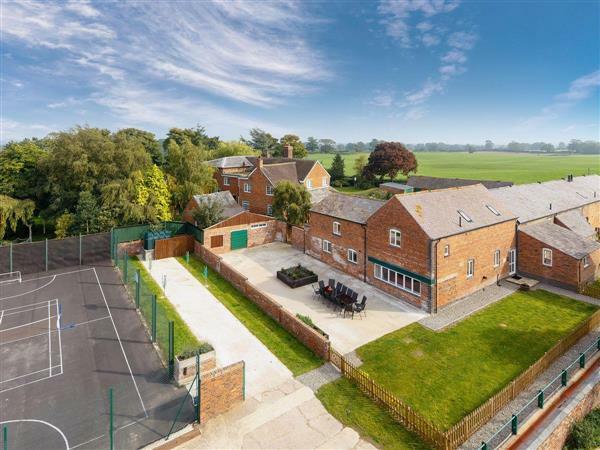 Alkington Grange Barns - Jamess Parlour is in Shropshire; should you be on the lookout for a special offer, you can find all the special offers in Shropshire. It's always worth checking to see what is on offer at the moment. Do you want to holiday near Alkington Grange Barns - Jamess Parlour (30917), you can see other cottages within 25 miles of Alkington Grange Barns - Jamess Parlour; have a look to find your perfect holiday location.